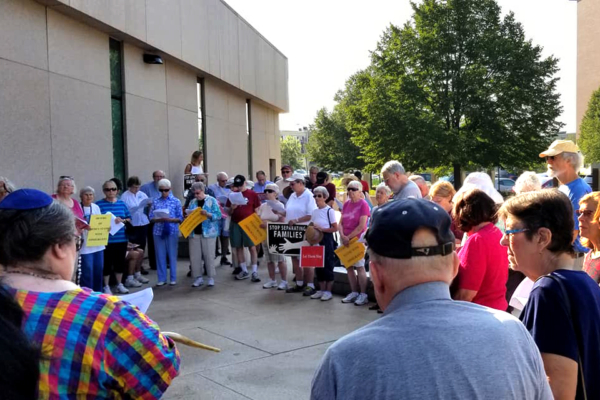 [Episcopal News Service] Episcopalians will join others in the New Hampshire faith community this month for a four-day Solidarity Walk for Immigrant Justice, tracing detained immigrants’ path from federal immigration enforcement offices in Manchester to a jail in Dover to raise awareness of immigrants’ plight and voice their support. “We’re following on foot the path that people who are detained and taken to jail are themselves traveling,” said the Rev. Jason Wells, an Episcopal priest who serves as executive director of New Hampshire Council of Churches, one of the Solidarity Walk organizers. This pilgrimage will begin Aug. 22 with a short prayer service at St. Anne-St. Augustin Catholic Church in Manchester, and the walk will kick off from the Norris Cotton Federal Building, where offices of U.S. Immigration and Customers Enforcement, or ICE, are located. The building also has been the site of regular prayer vigils scheduled for days when immigrants are known to be checking in with ICE, some fearing they will be detained or deported. The Episcopal Church’s support for immigrants, including those facing deportation, was underscored last month by the 79th General Convention, which passed multiple resolutions on immigration issues after hundreds of bishops and deputies gathered for their own prayer service outside an immigration detention facility near Austin, Texas. Organizers of the Solidary Walk in New Hampshire have invoked that example as they plan to gather at the end of their 40-mile journey outside the Stratford County jail, which has a contract with the federal government to hold immigration detainees. Although Rockwell will not be available to participate in the Solidary Walk, others at Granite State Organizing Project have been involved in planning the walk. Theirs is an interreligious organization devoted to grassroots community advocacy, and it is one of several groups contributing to next week’s walk, including American Friends Service Committee. At the frequent prayer vigils organized by the same groups, about 50 or so people gather outside the federal building in Manchester. They embark on a Jericho walk – seven times around the building, often in silent prayer. More prayers and songs follow, as well as readings from various faith traditions’ scriptures. During the vigils, some clergy offer to wait with the families of noncitizen immigrants who are checking in. The families typically don’t know if these will be routine visits to provide updates to authorities or if their loved ones suddenly will be told to return by a certain date with a plane ticket back to their native country, Wells said. Some have been taken straight to jail. Most immigrants who the New Hampshire Council of Churches are supporting have been required to check in with ICE about once a month, a frequency that has increased since President Donald Trump took office, Wells said. Previously the check-ins may have happened only about once a year. The Stratford County jail, one of six facilities in New England that hold immigration detainees for the federal government, also has seen an uptick in immigrant detainees in recent years to about 115 a day in 2018, according to the Concord Monitor. Some of these immigrants came to the United States on work visas that have since expired, so they are trying to gain permanent residency status, Wells said. Others are asylum seekers or refugees or have temporary protected status because the federal government at some point determined it was unsafe for them to return to their home country. Organizers of the Solidarity Walk say one goal is to draw attention to the prevalence of such immigration cases in upper New England. This is doubly important in a northern state that doesn’t normally get associated with immigration issues, Wells said. The walk will be broken into segments of about three hours each, with the morning and afternoon segments totaling about 10 miles each day. About 50 people have signed up so far to walk at least one of the segments, and other volunteers will drive the same route in support vehicles. The Solidarity Walk will conclude each days’ segments with events in towns along the way – Candia, Raymond and Lee – with walkers invited to camp overnight at churches that have volunteered their space. In addition to raising awareness, participants in the walk want to bring detainees a direct message of support. Organizers are working on how to communicate that support to those inside the county jail as they plan a prayer vigil outside on Aug. 25. Wells said he and others felt inspired by stories of the Episcopalians who on July 8 shouted, “Te vemos – we see you,” to the immigrant women being held at the T. Don Hutto Residential Center in Taylor, Texas. If he has the opportunity, he hopes to offer similar words of support to the immigrants being held in the jail in Dover.